Morning: My beauty routine is much more focused on functional foods and herbs than the typical skincare products that are applied topically. I’m not much into miracle quick fixes, but I do believe in consistency and in clearing out toxins as a proven means to purify the body, which in turn, improves aesthetic results. My beauty routine is also my wellness routine. I see them as one and the same. The foods I eat, the products I don’t use, my lifestyle practices, these are more of my beauty routine than what I apply on my skin. At 45, I think that is what has kept my skin relatively wrinkle-free and has kept my hair from going grey. When I wake up, I immediately drink water. It hydrates my body and gets things flowing. 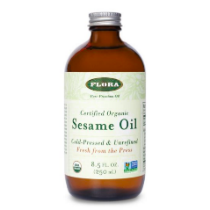 I swish my mouth with Flora Health Sesame Seed Oil for 10 minutes before brushing my teeth. It keeps my mouth free of bacteria and my gums healthy. I try and expose my skin and eyes to the sun very soon after waking as to naturally soak up vitamin D.
I walk barefoot outside and take some deep breaths, calibrating to the rhythms of nature and my day. In the morning, I drink an espresso (yes, I consider this part of my beauty routine!) and a glass of chlorella water. As many who know me can attest, my passion for a clean lifestyle runs deep, so of course I apply my own philosophy and products – The Body Sculptor is the morning ritual from my Olio Maestro system and my favorite product. It’s like a mini workout for the lymph. It helps release any fluid retention I may be experiencing, and prevents waste buildup and cellular aging. The lymphatic system is often overlooked as a foundation for good skin, but when it functions properly it works wonders and truly gives us that inner/ outer glow. I wash my hair with the Amla shampoo and conditioner from Hairprint. In terms of makeup staples, I love and use daily the In Fiore Soleil Fleur Before Sun Treatment mixed with a very tiny bit of foundation. And I absolutely love the RMS lip2cheek stains. I use them on my lips, cheeks, and eyes. Then, I finish with a little mascara and voilá! Bitters – I sip on these to help with digestion and bile production throughout my day. I vary brands, but at the moment I’m into King Floyds. My office contains a collection of essential oils, which I apply directly and liberally onto my skin – frankincense does wonders for dark spots and geranium is a must for skin tightening. Or, I’ll diffuse oils into the room – rosemary or peppermint work really well for focus. Ylang ylang or rose for relaxation. And lotus for meditation. Lately, I’ve been going to the infrared sauna 5 days a week. I view this as a beauty treatment because it detoxifies my skin and gives me a pretty glow. I wash my makeup off with another In Fiore product, ‘Bois de Rose’ (it’s not really meant for make-up removal, but it works wonders for me). I apply Vitamin C Serum from Skinceuticals. And I finish with May Lindstrom’s The Blue Cocoon, which feels and smells amazing. On my body, I apply the Olio Maestro Anti Cellulite oil. And I elasticize the fascia with our suction cup. There is no silver bullet for cellulite. It is caused by so many factors including hormonal changes and inflammation, but a daily routine of this system has really been effective and has shown results for me and so many of my clients. What is the importance of using natural beauty products? 80% of what your skin looks like on the outside is determined by the function of the skin on the inside. Our beautiful outer skin protects, nourishes and detoxifies our body. Yet, the inner skin does the same. Much of what we spend money and time on is caring for just the surface layer of the skin, but we have an intricate epidermal system that envelops our entire intestinal tract and is responsible for that outer glow and smooth skin appearance we love. When we care for the inner skin in the same manner we do our outer skin, we achieve even greater skin radiance and beauty. Natural products are important because what we apply on the skin gets immediately absorbed into the body without the buffer of digestion. Because we live at a time where man-made chemicals are everywhere and we are exposed to them on a daily basis, we are more susceptible to them playing havoc with our health and appearance. It’s not one product that will affect us; it’s the ongoing exposure that will. For example, that receipt you touched as you thanked the cashier at the grocery store? That probably contains an endocrine disruptor that can affect your hormone balance. The pretty body wash you love lathering with? Endocrine disruptor. A woman’s body is hormonally sensitive, and in this modern world we are forced to adapt to an environment requiring constant housekeeping. The more we are careful with the make-up and body products that we use, the easier it will be to keep the body in balance and un-inflamed. Your approach to working with/ restoring women’s natural beauty and confidence is inspiring! How does your practice of mindfulness come through in your approach to beauty? I think we’ve all seen that it’s not wrinkle-free skin that gives a woman her youthful appearance, or fuller lips, or a bigger / smaller bra size. Natural beauty is effortless. It stems from a woman really knowing herself and being generous with her gifts and all the parts of herself that are human. I think that’s why women in their 40’s are so interesting. I see my friends discovering their own unique qualities at this age and becoming less interested in following societal norms. This results in them becoming irresistibly beautiful in their own unique way. Tell us about the No Self Project. Where did the idea come from? How can this type of self-inquiry benefit our daily lives? In my 20’s and 30’s I traveled through India for almost 10 years. I’ve always been very insistent on knowing who I am. I sat in mediation for many years, but the deepest understanding of myself seemed elusive. At a certain point in my life, about 7 years ago, I spontaneously began to look for the one that was doing the looking. The NO SELF cards are the questions I asked myself during this period. The card deck allows you to contemplate and question all your assumed identities. By asking “Who am I, really?” and examining all presumed identities, you discover what you are beyond the identification to this body, to this mind, and this doer. Once the character you believed yourself to be is seen through as false identity, there is a freedom and peace that is beyond understanding. Jasmine Hawken is a woman full of energy, joy, and kindness – when she entered the studio on a chilly morning, she immediately brightened everyone’s day with her bubbly personality! She also happens to be a nutritional consultant and beauty entrepreneur whose list of personal projects runs deep! She is the Founder of Olio Maestro, an all-natural line of oils designed to flush the lymphatic system. She is also the Creator of the NO SELF cards, based off her own interests in meditation and self-inquiry, in addition to being the Owner and Co-Founder of Hairprint, an all-natural line of products that reduces gray hair without synthetic dye! A minor but irksome comment nonetheless – as someone who started going grey at 13 and became a completely silver fox by 30 – it is genetics that stop your hair from going grey and has nothing at all to do with lifestyle practices. To suggest that you can prevent grey hair by adopting a certain diet is completely untrue. And why is having grey hair something to prevent anyway??? I love my hair. I get way more compliments on my hair in its natural state then I ever did when I dyed it dark brown… the best thing I ever did at the age of 44 was to stop dying my hair and start rocking the silver. Hello, I found this article really interesting and wholeheartedly believe that the food we eat and don’t eat is essentiel to good health and beauty. This is also true for the products we use on our bodies. The comment made by Kath dismissing the fact that diet has an impact on grey hair is an uninformed one. She may like to read the book by Gayelord Hauser “Look younger, live longer”, written in the 50’s where he explains the impact of vitamin B on stopping the appearance of grey hair. I have a 66 year old friend who followed his nutritional suggestions and she does not have one grey hair on her head. It is refreshing to read about a woman who looks within herself to find her beauty and uses products to enhance and support that, as opposed to looking ot a cosmetic shelf for all the answers. While I do admire this woman and I pray that I can one day too afford to go to a sauna 5 days per week, where are the “real” women? I am a longtime reader and I am because Garance would always show the beautiful, ugly, and humorous views on life. I hate to be a Debbie downer, but I feel like the blog has been over saturated with LA fluff and unachievable lifestyles lately. haha i get it! LA has a very unique lifestyle. Anybody knows where is her necklace from? I am really intrigued her no self cards. I went to her web site to purchase it but they have problem with payment system.? Very Nice Blog… I have colored my Hair’s Half Length I Love the color..
Est-ce possible d’avoir cet article en français s’il vous plait? Actually updating this one right now! It should be ready in just a few moments, thank you so much for your patience!